Now, Peaches, we all know, you really just can't mean that. The meaniest meanies in the whole world don't mean that. I think she does. It is 24 degrees, the ground is frozen, the propane tank is nearly empty, and there are errands to run. The garbage pail is overflowing. I have to go look at a dead ivy tree by a flooding river. I just got new glasses and they are hard to see through. Oh - and I am about out of bird food and there are three chickadees, two juncos and a big blue jay staring in the window. Not looking happy. At least Peaches is a cute bunny! 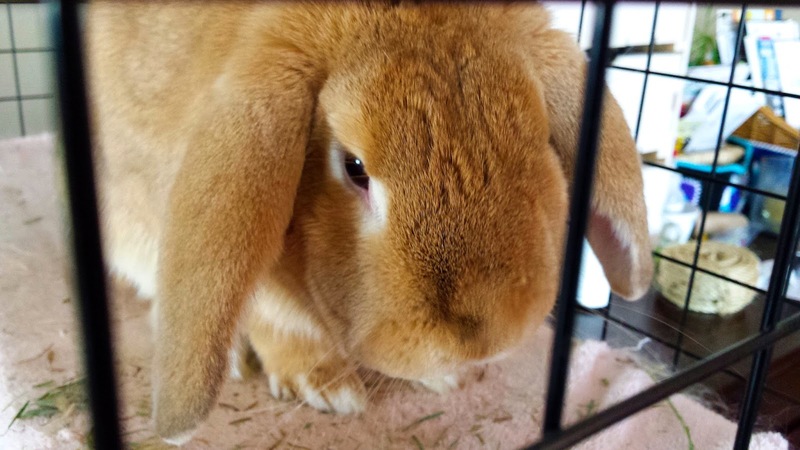 Peaches knows that hoomins dislike M*nd*ys, and she's going to exploit that fact, when she punishes us all for her hoomin's foolish bunicure stunt. Her ears are pointing firmly downwards, much like the opposable digits of Romans signalling that a gladiator should die. It's not looking good for us. I don't suppose a bunneh-nose-smooch would be a good idea right now, would it, Peaches? Hmmm? Is that a "No"? Peaches, dear, whether you intended it or not, seeing your cuddly orange fur, frowning ears and outraged pout just put on smile on my face and improved my M*nd*y, *smooch*! I don't know about the rest of you, but I am willing to take the risk and scritch her little chin. "I don't like hoomins! I'm gonna dis-aa-aa-proo-oo-oooove the whole lot down!"